New India Assurance Company Limited (NIACL) is a government owned Insurance Company is currently operating both in India and foreign countries. Recently after releasing itself from being the subsidy of General Insurance Company Limited (GIC), it has had a collaboration with a leading public-sector bank and Financial Institutions in India to increase its distribution network. The Job nature of the Assistant position in NIACL will look alike the duties of a clerical Officer in Nationalized Banks. There may be a minor difference in their duties depending up on the location they appointed (whether in branch, divisional office or Regional office). The work nature of the Assistant in NAICL will mainly be like, issuing insurance policies (which will be marketed by Insurance Agents and Development Officers), Settling insurance claims, Accepting cash and Routine office administration etc. Since NIACL Assistant Job is a risk free permanent Job that includes less dealing with the public and money than a Bank Clerk does. Candidates who looking to join as a Clerk in Banking Sectors would grab this Recruitment with ease. NIACL Assistant is like an entry level clerical post with salaries more or less equal to the salary of a clerk posted in a Nationalized Bank. Scale of Pay: Rs.14435 – 840(1) – 15275 – 915(2) – 17105 – 1030(5) – 22255 – 1195(2) – 24645 – 1455(3) – 29010 – 1510(2) – 32030 – 1610(5) – 40080. Approx. salary of an NIACL Assistant would start from Rs. 23000/-. It would increase according to the Position & Promotions. Apart from the Pay scale, allowances will also be provided as per norms. Benefits such as lump sum domiciliary medical benefit, membership of Group Mediclaim Policy for Reimbursement of hospitalization expenses, leave travel subsidy and other staff welfare schemes, facility Company’s accommodation or leased accommodation will be provided wherever applicable. Candidate who joins as an Assistant in NIACL will be promoted to Administrative Officer, Development Officer and Manager positions according to the efficiency of the duties he/she associated. NIACL is also conducting Internal Promotion Exams which enable an Assistant to grow faster in both Salary & Job Position. 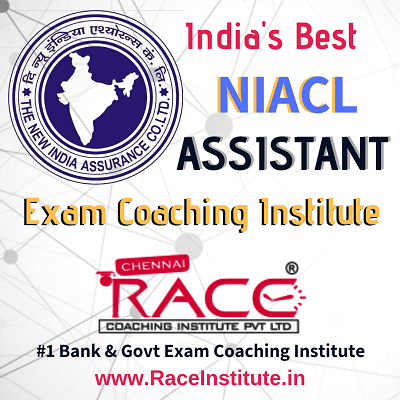 RACE Institute, a pioneer Institute for Bank & Govt Competitive Exams provides the best coaching for NIACL Assistant Examination in all the Branches of RACE Institute. Students joining NIACL Assistant Exam Coaching in RACE, will also able to crack all the examinations conducted by LIC, GIC, NICL, NIACL Insurance Companies as well as Bank Examinations conducted by IBPS, SBI, RBI, NABARD & Pvt Sector Banks. Because the Bank Competitive Exams cover almost 80% of the NIACL Insurance Exam Syllabus. So, Banking aspirants could crack Insurance Exams easily. By keeping that in mind, we are offering Bank & Insurance Exam Coaching for just Rs. 13000/-. The Coaching methodology, facilities & Practice Programs in RACE institute will surely make you crack exams like NIACL Assistant Exams. Want to Become NIACL Insurance Assistant Officer? The NIACL exam will be conducted in 2 stages – Prelims & Mains. Let us look at the exam pattern of each stage one-by-one. The exam will be available in both English and Hindi. Except for Test of English Language. Candidates will have to secure sectional cut-off decided by the organization. An adequate number of candidates for state-wise and category-wise vacancies will be shortlisted by the company and they will be allowed to appear for Tier-II Mains exam. Candidates need to acquire a minimum score (decided by the company) to clear the Mains Examination. Negative marking of 0.25 marks for each wrong answer will be deduced from the mark scored. Candidates clearing Mains Examination will have to appear for the Regional Language Test. The regional test is also qualifying in nature. Along with the marks obtained in regional language test, the Mains Exam Scores will be taken into consideration for preparing the final selection list.